Sarah Sundin's first novel, "A Distant Melody," was published in March 2010 by Revell. She lives in northern California with her husband and three children. When she isn't ferrying kids to soccer and karate, she works on-call as a hospital pharmacist and teaches Sunday School and women's Bible studies. 1. Hi Sarah! I've heard you've had some unusual contest experiences. Can you share them with us? Actually, I've only entered one contest. 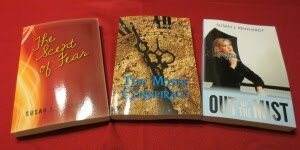 In 2008, I entered the Genesis, American Christian Fiction Writers' contest for unpublished writers. I had scores all over the place, from, "I can't wait to see this in print," to--and I'm paraphrasing--"Don't quit your day job." I was concerned because I'd already submitted the same chapters at Mount Hermon Christian Writers Conference to Vicki Crumpton, at Revell. I'm very thankful Revell agreed with the I-can't-wait-to-see-this-in-print judge and offered me a three-book contract. 2. I loved the characters in, "A Distant Melody." Will some of them be showing up in your second book? Can you give us a short blurb? Walter Novak and Allie Miller, the hero and heroine of, "A Distant Melody," will appear as side characters in, "A Memory Between Us," which focuses on Jack Novak, Walt's brother, and Army nurse, Lt. Ruth Doherty. "A Memory Between Us" is the second book in the Wings of Glory series, which follows the three Novak brothers, B-17 bomber pilots with the US Eighth Air Force stationed in England during World War II. Major Jack Novak has never failed to meet a challenge--until he meets Army nurse, Lt. Ruth Doherty. When Jack lands in the Army hospital after a plane crash, he makes winning Ruth's heart a top priority mission. But he has his work cut out for him. Not only is Ruth focused on her work in order to support her orphaned siblings back home, she carries a shameful secret that keeps her from giving her heart to any man. Can Jack break down her defenses? Or are they destined to go their separate ways? 3. Plotter or SOTP? How do you flesh out your characters? Big-time plotter. I'm rather left-brained for a writer, and I need to know most of the details before I start the rough draft. It saves time during editing too. I do encounter surprises when I write the actual story, but never major plot-changing surprises. My favorite part of writing has to be getting to know my characters. And being a rather left-brained writer, I adore character charts. Long, detailed character charts. My master chart for hero and heroine has questions about appearance, health, family, friends, childhood, education, career, romantic history, home, talents, hobbies, religious history, goals, secrets, etc. Then I give the main characters personality tests. On the back of the pages, I scribble down important incidents in their pasts. It's amazing how a seemingly mundane question on a chart can open up backstory or motivation that makes the character come to life. Sarah and I will continue our interview next Wednesday. She'll give us the lowdown on her research methods. Thank you Susan, for interviewing Sarah and sharing it with us!! Hello, Sarah! Good to see you here at Susan's place! Cynthia Ruchti, another exciting writer, is hanging at www.pattilacy.com/blog today. Would LOVE to have y'all drop by. Nice interview, Susan. Sarah, I adore character charts and plotting too! Thanks for giving us a peek into your process. Thanks for sharing this interview, Susan! Neat to hear about Sarah's experience with Revell. I've heard great things about the Mount Hermon Conference and have it listed in my top 3 to attend in 2011. Looking forward to the rest of this interview! Blessings! I'll be popping by later today or tomorrow. I've also heard good things about Mt. Hermon, but it's too far for me. 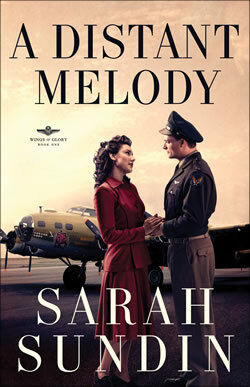 After reading Sarah's book, "A Distant Melody," I can understand why Revell offered her a contract. Excellent book. Maria - Mt Hermon is worth every penny. I live in northern CA, so I can just drive down, which makes it more economical for me. I also love the ACFW conference. I can't attend this year because that's the weekend I'll be moving my oldest son into the dorms (sob), but ACFW is a fantastic. This sounds like a good series. And I learned a new literary term from Sarah. Thanks for the interview, Susan! I love what she says about getting to know our characters. I like that part of writing as well, especially when they surprise us. I'm jealous of Sarah's plotting skills! I'm trying to change my SOTPs ways. Thanks for the interview, Susan. I'm looking forward to next Wednesday! Hi Sarah! Congratulations on your book. Good interview. I knew you were a plotter. :-) I ought to, we're in the same online critique group. Your character sketches sound a lot like mine. I'm so glad Revell saw your talent and picked up your series. Heather - I love the surprises too - even when I've filled out my charts perfectly, the characters still surprise me. Bonnie - I'm so glad I'm in the Revell family with you - and the crit group too! Great interview, Sarah and Susan! I-can't-wait-to-read-this-book! Just shows you how subjective judges are. You're welcome. I've realized the necessity of developing characters prior to writing a manuscript. As a SOTP writer, winging it made for some strange, out-of-character moments. I've been trying to go the plotter route with my latest book, but it's so different from SOTP. I feel like my creativity and storytelling are hampered by extensive plotting. Welcome to my blog. I post here Monday, Wednesday, and Friday. I hope you'll pick up Sarah's excellent books. Your point to Kristen is well taken. Perhaps we operate on a grass-is-greener mentality. Plotting is often held up as the ideal. LOL! I marveled at how her marks for the Genesis contradicted each other. If you believe God has called you to write, never give up. Sarah's books look like they are very well done. She certainly puts a lot of work on her characters. Good for her, and for the story too. I'm looking forward to reading the rest of this series. Sarah did a wonderful job with the time period, characters, and story. Don't miss Part II of the interview. Sarah has more to share with us. Sarah's experience with the Genesis contest gives me hope. Thanks for a great interview! One of my WIPs is based on my great-great grandfather. He keeps changing. I don't think my dad will recognize him. Sarah's experience underscores the subjective nature of publishing. Improving my craft and staying sensitive to the Lord's leading is the only way to keep my sanity. LOL! Unless we're doing a biography, I don't think it's necessary or prudent to replicate an individual. Perhaps you can tell your dad that your character was inspired by your ancestor but is not the same person.